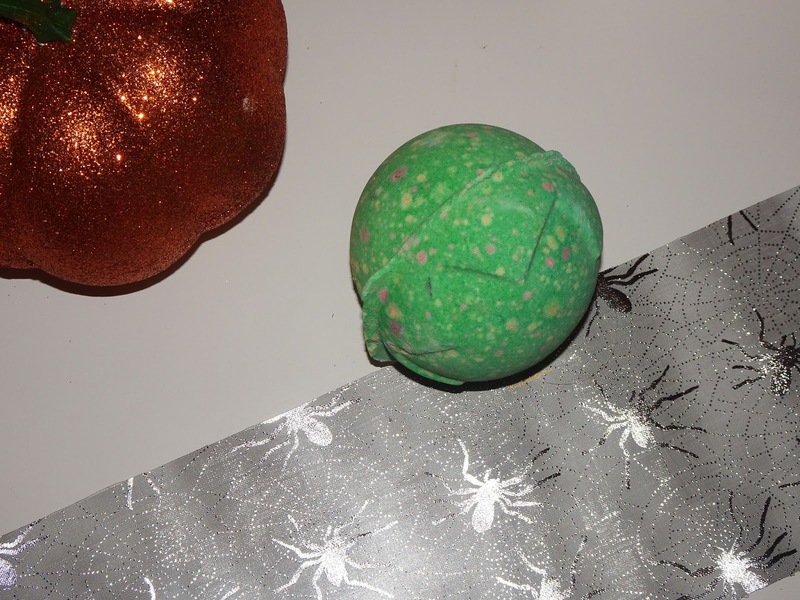 Halloween is peeping round the corner at us and the bath bombs are out in full force. Lush always come up with some of the coolest ideas and I love using them. I decided I wanted the Lord of Misrule one this year and although I think I have used it in the past it was nice to have it as it has been a few years. This is a popular bath bomb that Lush bring out year after year and I know it always gets good press. The bath bomb starts out as a beautiful green ball, it looks very plain and doesn't have a lot about it. It has a bit of a star like indent in the top of it giving it some dimension, but it is plain at a glance. The bath bomb is scented with patchouli and black pepper and while it doesn't sound the most pleasant it is such a lovely smell, maybe a little more masculine smelling, but definitely has a warming scent. I'd say it is a slightly stranger one and probably more of a love hate one, so I recommend going to store to smell where possible if you are unsure! When dropped into the water the bath bomb began to fizz and turn the water green. As it fizzed for a while the bomb slowly dissolved to reveal speckles of crimson on the bath bomb. As it dissolved further the crimson began to show more and swirls of beautiful pink and green covered the tops of the water swirling together to create beautiful patterns. The patterns were mesmerising to watch and looked so enchanting as they swirled together. When the bath bomb stopped fizzing and the water was calm again the bath had transformed from the clear water, to green and then through to a bright, blood red colour that looked like you are bathing in a blood bath, perfect for Halloween! If that doesn't sound appealing, it is like bathing in red wine which sound more inviting, but much less Halloween themed! The water was lovely to bath in and the bath smells lovely when you are laid in it, but I do enjoy the scent personally. Overall I think this is such a great bath bomb, the change it has in the water is complete contrast to what I thought it would do when I first ever used it and I think the blood red water is the most Halloween you can get! The bath bomb is a nice surprise with the way it reacts and I definitely think it would make a lovely gift. At £3.95, on the Lush site here, it is one of the cheaper bath bombs from the range and I think it makes a stunning bath when you use it. I definitely would pick this one up again if I get the chance to before Halloween is over!